Trieste - Abdus Salam International Centre for Theoretical Physics-ICTP's four-day celebrations for its 50th anniversary began in Trieste on 6th October with greetings and congratulations from heads of the United Nations as well as important local and international dignitaries. The anniversary events are taking place from 6 to 9 October, with lectures expected from Nobel laureates and policymakers underscoring the importance of science for development. 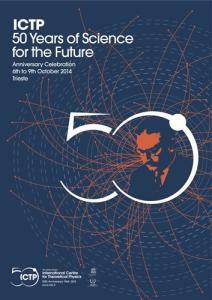 More than 250 distinguished scientists, ministers and others will convene at the Centre in Strada Costiera, at the doors of Trieste, to mark the anniversary, giving ICTP an opportunity not only to thank its supporters who have helped keep the dream of Abdus Salam alive, but also to look ahead with a new strategy to meet the changing needs of a rapidly developing world. Inaugural festivities started with a video compilation of scientists from throughout the developing world who have personally benefited by ICTP's many research and training programmes. (The video testimonials of the alumni are available on the Support ICTP page). "Today is a very special day for the ICTP community since we are celebrating 50 years of a unique institution that over the years has become more and more relevant to the needs of our planet and its inhabitants, for science as a key component of our culture, science for development and as one of the most effective means of our survival," said ICTP Director Fernando Quevedo to a crowd of nearly 300 attendees at ICTP. "ICTP's founding fathers, particularly the Pakistani Nobel Laureate Abdus Salam and his visionary partner, the Italian physicist Paolo Budinich, had a dream more than 50 years ago, to create an institution that can bring scientific excellence to all corners of the world," said Quevedo, adding, "They managed to turn this dream into a reality and it has been an honour for me during the past five years to contribute to keep this dream alive." Talking on behalf of the Italian government, Mario Giro, Undersecretary of State for the Italian Ministry of Foreign Affairs and International Cooperation said that Trieste is a very important centre for international science. "Here in Trieste you are nurturing a better and more peaceful future for us all," he said addressing the audience. "There is no future without science," he added. Giro delivered a special message on behalf of the Italian President Giorgio Napolitano, who visited the centre in 2008. UNESCO Director-General Irina Bokova highlighted the importance of ICTP as a hub for scientific collaboration. "ICTP is the first global science research organization ever created," she said, adding, "It has demonstrated that it is a successful model to respond to the needs of scientists in the developing world and to build scientific capacity." Bokova said that ICTP's mission "resonates deeply with the mandate of UNESCO," adding, "This 50th anniversary is an opportunity to pay tribute to the ideals we share." IAEA Director General Yukiya Amano acknowledged the long history that the Agency and ICTP share, pointing out that, "Theoretical physics underpins the work done at IAEA." He outlined the many fields that nuclear sciences are making a difference, including human health, food security, and environmental protection. "Nuclear science and technology have much to contribute to development goals," he added. Hamadoun Toure, Secretary General, International Telecommunication Union (ITU), underscored the importance of technology in helping to disseminate science and break the barriers of distance that separate scientists from all parts of the world. Knowledge only delivers benefits when it is disseminated and put in practical use , he said, adding: "I applaud ICTP's efforts to ensure that ever more people have access to mobile connectivity and the benefits from them." Michel Jarraud, Secretary General, World Meteorological Organisation (WMO), noted that, "ICTP has become an essential center of reference for developing countries." Rolf-Dieter Heuer, Director-General of CERN, complimented ICTP as "a centre of excellence for science and education - I can only say congratulations and a long life to ICTP." Further words of congratulations came from Rwandan President Paul Kagame. "ICTP and institutions like it enable scientists from Africa to make important contributions back home," he said, adding the follow-on benefit of this: "Connecting our young people to the scientific mindset can help them be better citizens." H.R.H. Prince El Hassan bin Talal of Jordan highlighted in his talk the importance of SESAME--the Synchrotron-Light for Experimental Science and Applications in the Middle East--to the development of science in the Middle East and to the exchange of ideas. He spoke about the need to forge collaborations across boundaries and the ability of science to connect cultures. Ansar Parvez, Chairman of the Pakistan Atomic Energy Commission, spoke about the role of ICTP and other international organizations in developing his country's scientific capabilities. He looked forward to further international collaboration.